The Samsung Galaxy S III is quickly turning into the most popular Android phone in the world. This follow up to the highly popular Galaxy S II and original Galaxy S III has features that every Android enthusiast (and some iPhone enthusiasts) have been dreaming about. It’s also a pretty expensive piece of hardware if it’s not subsidized. So now you need a case worthy of holding the precious Galaxy S III. That case is the new Shell Gel Maxx from Ballistic Cases. 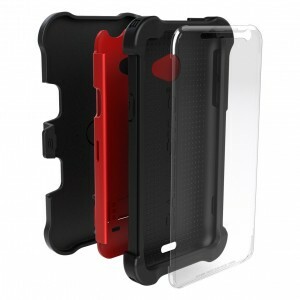 The Shell Gel Maxx provides maximum protection without the immense bulk of a case like the Otterbox. Not only is your Samsung Galaxy S III going to be protected from corner to corner but Ballistic has revolutionized the screen protection on the case as well. Rather than having a thin overlay film cover like an Otterbox case Ballistic has equipped that Shell Gel Maxx with a molded screen protector. The Ballistic Shell Gel (SG) Maxx is a beefed up version of the original Shell Gel. Similar to the original, this case integrates an outermost layer, which is made of soft rubber (TPU) for shock absorption, a second layer which is crafted with impact resistant polycarbonate, and a third layer built with soft outer TPU. The Maxx collection, however, “ups the ante” by incorporating stronger corners for increased drop protection, a horizontal holster, and integrated port covers. The Ballistic Shell Gel Maxx is available now for the Samsung Galaxy S III and coming soon for the iPhone 4/4S. You can get one today by clicking here.